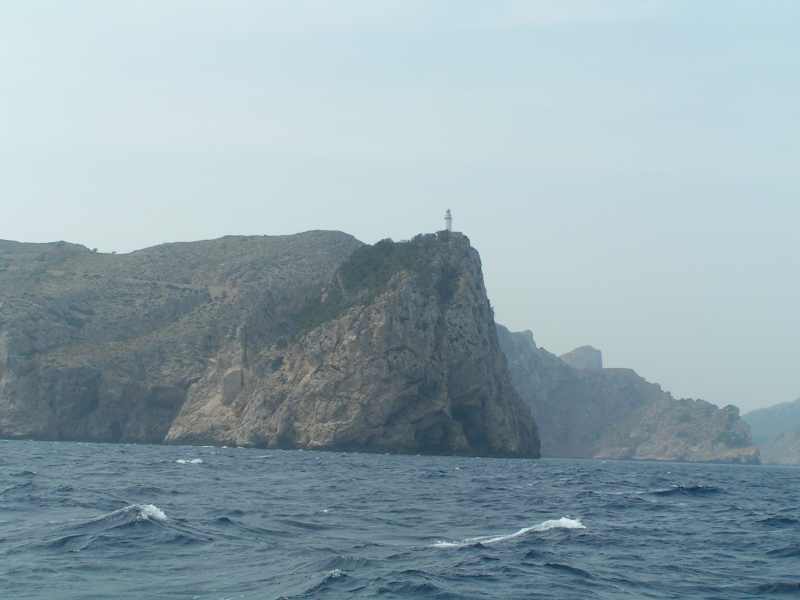 Rounding the Cap de Formentor was a milestone in our travels and probably even our life. 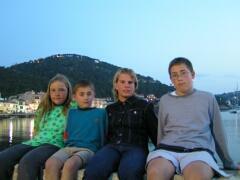 Ten years ago when my parents first came to Mallorca they hired a car and drove to the Formentor lighthouse. Standing there they looked down at the ocean below and watched a white sail glide gracefully across the water it was there that they said their biggest 'Someday'. Someday we will buy a boat and sail past this very point looking up at the ant like tourists gazing down at us, and you know what, they did it! Although we spent most of our first summer in Mallorca sailing up and down the south-west coast, we had never ventured to explore the north-west coast and, thinking about it although the north-west coast is geographically beautiful there are not many suitable anchorages and long term bay hopping would get a bit boring. The hours were passed taking photographs and finding shapes in the rocks or in my case running downstairs every ten minutes to see what our ETA (estimated time of arrival) in Andratx was. Dad was rather excited when he looked at a strange rock formation and saw a Leonardo Da Vinci look alike staring back at him. Although I blame this seeing of famous artists to 'The Da Vinci Code', a book my dad was reading at the time and probably got him on the lookout for hidden signs. The entire northwest coast is deserted and I kept having the strangest feeling of 'Dejavu' as I looked at the empty cliffs stretching for miles both behind and in front of us. All of a sudden the scenery started to change, or as least in the five minutes I was down stairs checking our ETA. Bushes started springing up here and there and we were soon passing small groups of pine trees and houses soon became visible. We stopped to have a little motor around the bay of Torrent de Pareis which was incredibly beautiful and yet was not a safe place to anchor so, after taking a few photos we continued on our way down the coast. As the sun slowly sunk in the sky we decided that we would not make Andraitx before nightfall, and although we know Andraitx well enough to make a night time approach we were suffering from lack of sleep and decided to stop in the Port de Soller for the night. Soller is a lovely little fishing village and Gilana spent the night comfortably nestled in the midst of a small fleet of brightly coloured fishing boats. We left Soller at 6:45 the next morning motor sailing out of the bay and around the corner with some of the fishing boats. The entire 'sail' from Soller to Isla Dragonera was actually a motor as there was barely enough wind to turn the Aerogen let alone fill the sails. The wind picked up slightly as we rounded the eastern point of the island and we made the last two miles of our three thousand four hundred mile trip standing on the cockpit cushions peeking over the dodger, quickly ducking down as a shower of water sprayed over head. I think I am correct in saying that, although we have been back to a few places, Andraitx is the first place that we have come back to and have known that there were people that we knew waiting for us. Since we left Andraitx four months ago I had had no contact with Kayleigh and although I am used to this coming and going of people in and out of my life as we moved to different places, I really missed Kayleigh. The reason I suppose is that, since we became good friends in October we hardly ever left each others side, I would pick Kayleigh up from the bus stop after school and we would spend the entire day together sometimes only saying 'good bye' after we had had dinner together. The surprise on Kayleigh's face when she opened the door to me was well worth waiting for and as she stood there quite speechless I was happy that I had surprised her as to our return. As we are spending winter here in Andraitx I have decided to write any exciting news once or so every month as it would be impossible to remember all the naughty things Kayleigh and I got up to, although I could quite easily count the good things out on all the fingers on my foot. Right, firstly there's the skate park, which took up most of our after school hours. 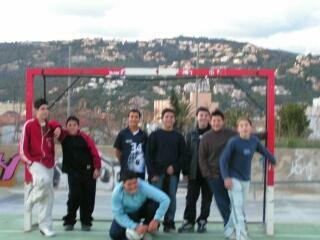 Although I had seen the sports ground a few times I never really realised that lots of kids actually hang out there. When I arrived there it was about three o'clock and there was no one there and my first thought was 'Obviously no one comes here so I can practice on my roller blades without being thoroughly embarrassed when I fall'. At about four thirty, to my amasement people started to arrive. First were some boys on Roller blades whom I now know to be Max, Bruno, Simon and Pablo. To my surprise Niels came next although not to roller blade but to have a game of football with six or seven other kids who arrived after him. Between the boys skating on the half pipe, Niels and his friends playing football and the kids playing basketball I managed to find a small area in which I could rollerblade, and just like that, we were in. Kayleigh and I have now become regulars at the skate park and have met lots of people with the same interests and are making quite a few friends. We experienced lots of things at the skate park, the most important of which I think is our sense of unity, somewhat like a tribe but not quite a family. One night Kayleigh fell on the quarter pipe and landed awkwardly from my point of view but I dismissed it, as I was hanging upside down on the goal post. When Kayleigh didn't move for a few seconds I jumped down to see what was wrong. Leaning over her I saw that her left arm was bulging out at the wrist and although she thought she might have broken her arm I quickly dismissed the thought as, as far as I knew a break was incredibly painful and apart from Kayleigh saying 'Ow' once as she fell there were no signs of tears and I thought the pain couldn't have been too bad. As soon as I got Kayleigh's roller blades off I called my parents on my two-way radio and told my dad we would need a car and a driver to take us to hospital. Once Kayleigh had had the anaesthetic the doctor who happened to be an orthopaedic surgeon started pacing the room resetting an invisible arm over and over again. I stood at the side of the bed and held Kayleighs hand I told my dad it was to comfort her but in actual fact I was the one that was crying and Kayleigh was the one who squeezed my hand and said 'it's alright.' The bone was perfectly reset the first time and is now well on the way to recovery. I believe every story should have a motto and the motto of this story is ' If you ever break an arm don't take me to the hospital to comfort you as the chances are I will have a nervous break down if I ever have to do that again. Kayleigh broke her arm on the Thursday and we went roller blading on the Friday, although she still hasn't ventured to go up the quarter pipe again. 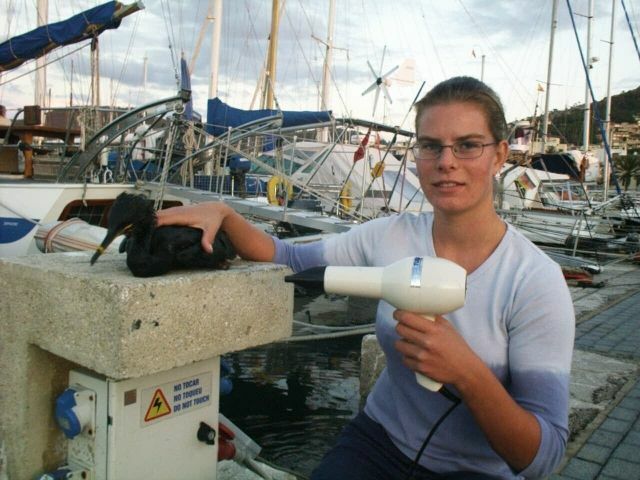 Over the years Gilana has turned in to a Rescue Care Centre for Birds and I am pleased to say that, like most things while cruising I am finding the RCCB an educational experience and I have a PHD in shoving fish down bird gullets. Unfortunately we were unable to save our last patient and although an autopsy was not performed we hypothesise that Comet the baby cormorant died from a poisonous fish, oil intoxication, shock or a combination of the three. Comet is the second bird that we were unable to save, the first being another cormorant whom we rescued in French Guyana but had been half drowned by being entangled in fishing line. Louie is a funny sort of friend. He has a disturbing habit of insulting complete strangers and often gets himself into a bit of a pickle. He enjoys doing out door things like gymnastics and going for walks, although I find I do most of the walking and he just hitches a ride. Although he has a good sense of humour he can be quite stubborn at times getting into a fluff over the silliest things. Things like me walking too fast and not offering him any ice cream even though we both know he doesn't like it. Jack and Louie get along well which is no surprise as I think Louie enjoys telling Jack what to do, and Jack, as long as he's being talked to he doesn't mind. 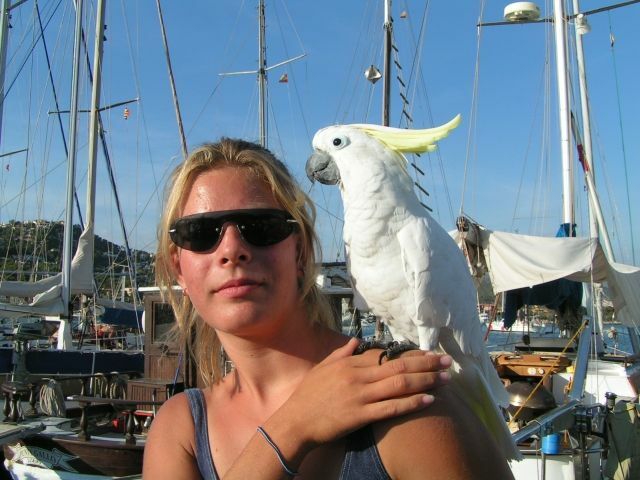 Unfortunately Louis moved to Germany and I will never see him again, I really am going to miss that Cockatoo. Out of all the, lets see how can I put this,' Exotic' things that I have done in my life asking my mom to highlight my hair with a blue black dye would have to be the most STUPID thing I have ever done in my LIFE, that alongside with jumping off a sixty foot cliff, twice! Unfortunately the blue black turned out to be more black than blue and the streaks ended up being more like bands running symmetrically across my head. Thankfully my hair it just long enough to tie up in a ponytail and looks ok if I brush my hair straight back and tie it. If however I tie my hair up with a parting down the middle it looks like I am wearing a hunting hat made out of skunk. I was also fortunate in the fact that the box said the dye would only stay in for a few washes. As you might know bad things (and good) always come in threes so here is a list of all three things that went wrong with my seemingly harmless hair dying episode. 1) I ended up with bands not highlights. 2) The dye was more black than blue. 3) To try and lighten the black bands I dyed my whole head light blond. Unfortunately it didn't affect the black blue dye, it merely made the contrast between my hair colours a bit more obvious. Instead of being dirty blond with blue-black bands, I am golden blond with blue-black bands. 4) I know things always comes in threes but this story is an exception to the rule. To top everything off my hair started falling out although I guess its getting me back for calling dad bald all those times. Oh yeah and the dye is still in, three months later. Rafael Verdera is the oldest wooden boat in Europe and we were fortunate to spend an afternoon onboard. 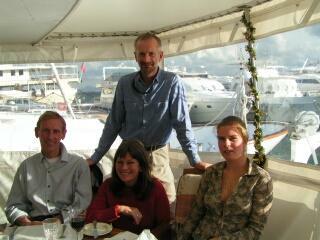 Dad will probably go into better specifics about the boats hull, design etc, so I will stick to a brief description. Two pilothouses, one at the stern and one in the centre lead below deck. The 'hold' which, used to house crew and provisions hanging on ropes (the provisions not the crew) has been converted into a playroom for the kids during winter and a communal cabin for chartered guests during summer. The back cabin had been modified and is where the owners and their two kids sleep. The children are four or five and although one is a boy and the other a girl they look exactly the same and are two of the cutest dolls I have ever seen. Shortly after arriving back in Andraitx I started working for a company in the port called Yacht Marine, which is a charter agency run by a British couple who also live on board. Much of my time after school was spent working and even though I sometimes only finished late at night I still managed to find time after school and before work to hang out with Kayleigh. As autumn drew to a close and winter set in, less and less people hired boats and I found that I had more time to spend with Kayleigh and doing the things that I wanted to do. I must admit however that, now we are in the middle of winter I don't really fancy getting soaked while cleaning a boat. If we are still here when summer begins I will be glad to start work again although I know it will be hard as my friends will be on school summer holidays and the offer to go water skiing will be hard to turn down. At the beginning of December each year we do the same as most people and haul out the Christmas decorations. The only difference is that the boat looks really stupid with Christmas decorations hanging all over the saloon. We solved this problem by designating a small area, which is the starboard saloon bunk and decorate just that area. At the moment in fact I am looking at the decorations, which include three decorations about 10 centimetres high, two cards, presents and a Christmas tree, which measures an amazing 30 centimetres. 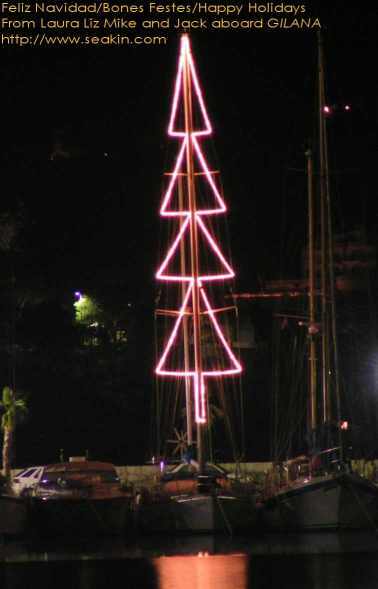 Our main decoration however is a sixty foot Christmas tree attached to the mast and constructed (by me) out of Christmas lights. This year I think our Christmas tree is better than it has ever been as, not only do we have more lights but they are also the tubular kind which we bought forty meters of in Turkey for only E20 (that's E 0.50 a meter for all you mathematically impaired who shouldn't even have a computer). Normally the construction of the Christmas tree takes about fifteen minutes, but for some reason this time it took me forty- five minutes which dad said is too long and that if I didn't hurry up he would just cleat the halyard off and leave me up there. I think the reason I took so long was the fact that the tubular lights are very heavy, bear in mind that I was dealing with forty meters of it while swinging from side to side on the end of a halyard. Growing up on a boat you tend to differ from the other kids around you, but that's ok because us unique species of kids can adapt to a changing environment. It is this changing ability and highly evolved brain that allows us to know all the worlds answers at the age of thirteen. Parents however do not cope well with this change and start doing mildly abnormal things. As the years slipped by these mildly abnormal things became completely insane ideas, the most recent of which was the purchase of two pig brains for yours truly. Now you might ask yourself 'Why didn't she quietly object by throwing a screaming fit, fainting, turn over the shopping cart and other small things that we do to let our parents know we have an opinion?' The truth is I wasn't present when this particular object was purchased and I had no say what so ever. While mom and dad were out making odd purchases I was all alone at home except for Jack, Kayleigh and Martin. When my parents arrived we all helped them bring the shopping on board. Martin then amazingly had a call from his mom to go home for dinner and Kayleigh made sure he could find his way. When they had left mom said 'Look in that bag, we bought something for you'. I don't know what I was expecting, not something big because they would have saved it for Christmas, not sweets because, well because my parents don't buy me sweets and I don't particularly like them, the sweets not my parents, 'maybe a hair band' I thought as I unpacked the bag. It doesn't matter what I was expecting because as I opened the bag and pulled out two nicely wrapped pig brains I decided to tell my parents that I hadn't been good enough to have a present and they could have it for themselves. There is no need to tell you about the protesting that went on inside the boat as I can easily summarise it by saying I had a very interesting Biology lesson the following Monday. I think my parents had a niggling feeling that I didn't want to dissect a brain or two for biology by the fact that it miraculously became my last lesson, and by me insisting on doing an extra amount if Trigonometry because "Practice makes perfect". Finally the dreaded hour came and I set up my microscope, the bread board, scalpel blade, my biology text book open on a page displaying a cross sectional diagram of the brain and my writing book. Mom denied my right to a surgery glove and I got down and dirty digging the brain out of its casing with my bare hands. I sliced through a membrane, which must have been either the Durra mater or the Pia mater. I slipped the scalpel blade along the folds of the brain gently opening each fold like the page of a book. The Cerebrum is the larger part of the brain and shadows the cerebellum which is probably why I had trouble finding it and I was going to mention to mom that I don't think Babe had a cerebellum but I decided I didn't want to fail biology with a remark like that, if I was going to fail biology anyway I was going to make a remark a lot worse that that one. At the base of the brain I found pieces of hard matter mixed up with the blood and realised that it must have been part of the spinal bone, connected to the brain though the medulla oblongata. Wanting a cross sectional view of the brain I decided to slice down the middle of the brain, separating the left and right cerebral hemisphere. A cream coloured paste ran out onto the chopping board and I experienced one of the most disgusting smells in my life. I think my brain was offended by me dissecting another brain and between the lurches of my stomach I managed to take a few notes and examine a few slides. Christmas is a time of giving presents, anticipation and most of all family. It is also about food. Many say to themselves that it's ok to eat a lot on Christmas day because, after all it is only one day, isn't it? The fact of the matter is that most people get into the Christmas spirit a bit early, say, November! It doesn't matter if we eat a lot at Christmas because, starting on the 1st January we will be going on that celery diet we have been planning to go on since last January but were unable to make the commitment. I had a sneaky suspicion that I could have been gaining weight when my clothes became a bit tighter around the middle in Wales, I decided that this extra tightness around my middle was not due to the fact that I was eating an average of five mince pies a day, but due to the fact that it was very cold and misty in Wales and my clothes had obviously shrunk. When I got home however I was shocked to find that every scale in Port De Andraitx was reading the same horrifying number, which could mean only one thing, a faulty batch of scales. 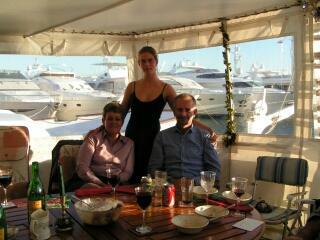 On the 19th December we went to a Christmas/Birthday party on Jill and David's boat 'Souris Rose' meaning 'Pink Mouse' in French. We spent the day eating and talking, although not talking while eating. Kayleigh was kind enough to join us and we often excused ourselves and went on deck for a few minutes when a boring topic was being discussed, debated or argued. To this day I am still trying to figure out if dessert was pudding with brandy in it, or brandy with a bit of pudding in it. As we ate our pudding with watering eyes the topic of conversation naturally changed to drunk driving and breathalysers. Dad, David and Nick were trying to figure out what would happen if one kept a raisin from the brandy pudding in their mouth and popped it as they breathed into a breathalyser, and naturally the policeman's face thereafter. While this conversation was going on at one end of the table, Mom, Jill, Wendy and Annie were discussing how to AVOID trouble. Wendy had all ears when she said that she had heard from someone that if you eat an anti-acid after drinking (or eating) alcohol the breathalyser would only pick up a faint trace of alcohol. This method has not been verified so until it has I advise you not drive while drinking as you need both hands to swing a golf club. It was with heavy stomachs and light heads that we left 'Souris Rose' after an evening of eye watering pudding, belt snapping eating and raisin popping conversation. In the days between the 19th and the 25th December we went on a fruit, vegetable, water and tea diet. I am also pleased to announce that the scales in the port have been fixed and the numbers are more believable. At the moment I am contemplating opening two lawsuits. One against the scale manufactures for the price of my blood pressure medication, which had to be readjusted after returning from Wales and one against the mechanic who claimed to fix scales, which he did, but couldn't have done a very good job as they were broken once again on Boxing Day. I find it strange as one spends months in preparation and anticipation for Christmas, a celebration which only lasts twenty-four hours. We spent Christmas morning opening and exchanging gifts both on Gilana and then for a cup of tea on Memphis before heading over to Palma to have Christmas lunch with David and Jill. I proudly announced while dishing up, that I like to try everything once. I took that comment back however when David brought a bottle of liqueur out. He proudly announced 'Try some of this, it is the most disgusting thing you have ever tasted'. And you want to hear something funny, we all tasted it except Andrew, and we all found it equally disgusting. If I had to design a meal consisting of all the disgusting food and drink I HAVE actually tasted, the dish would contain the following. Sea grass salad: uncooked sea snails arranged on a plate of sea grass, delicately sprinkled with gooseneck barnacles. Freshly cut fish eyes with raw sea urchins. Thinly sliced pig brain with a side plate of fat.